Terhune Orchards farms 200 acres in Princeton, NJ. The Mount family is 11th generation of farmers in central New Jersey and have been at the current location for 40 years providing fresh fruit and vegetables as well as a community destination. Terhune Orchards is recognized by New Jersey Department of Environmental Protection as a sustainable farm. We are involved members of our community and think it’s important to share how we go about providing fresh produce. Terhune Orchards is part of the Farmland Preservation program. This is a long term commitment to open space and our farm can never be turned into development so we farm here always planning towards the future and the next generation. We partner with experts such as Natural Resource Conservation and Soil Conservation District to preserve and build our soils. 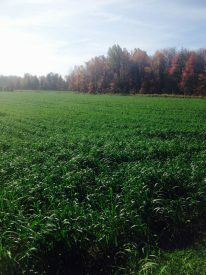 We use methods such as crop rotation and cover crops to help maintain and augment our soils. We use underground sensors to determine moisture levels and only water when necessary. In addition we use trickle irrigation so small amounts of water are delivered directly to the roots. We use drip tape that goes along the ground so that it goes directly to the plants and conserves water. 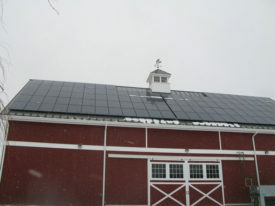 We use solar panels on our newest barn and work hard to minimize energy use at our farm. We also sell all of our produce and farm products on our farm, local markets and area restaurants. 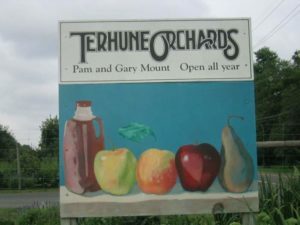 Terhune Orchards uses an approach that owner Gary Mount calls “bio-rational.” This means reducing inputs by applying sound science through multiple avenues, including Integrated Pest Management (IPM) and organic. As part of IPM, we use frequent scouting of the crops by experts from Rutgers University to assess insect populations and spot evidence of emerging disease, the use of a mini weather station to correlate rainfall and temperature with disease risk, and the use of mating disruption to break the reproductive cycle of insect pests. We conduct test plots with researchers from Rutgers to determine ways to reduce inputs while still dealing with pervasive pests such as stink bug. We are also USDA certified organic. This means our crops are tested and inspected by third party inspectors to make sure we are following organic guidelines. 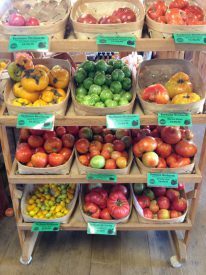 In the farm store, we designate which crops we grow and which crops are organic on each sign. During his career Gary has been named Apple Grower of the Year by American Fruit Grower magazine and received International Fruit Tree Association’s Hall of Fame award as international recognition of his expertise. 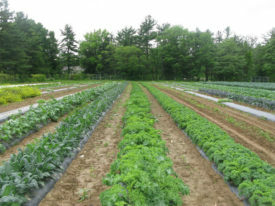 Part of our growing methods at Terhune Orchards involves maintaining diversity as well as heirloom seeds. For example we grow 35 types of apples, 15 types of carrots, and 30 types of squash. We also grow 20 types of tomatoes and most of them are heirloom varieties. 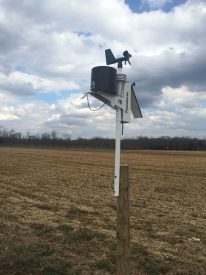 One example of our use of modern technology is our weather station. Anyone can view its data on weather underground using the name Princeton Terhune. 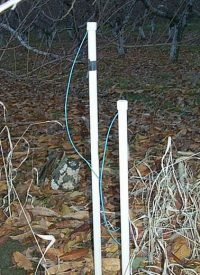 Our weather station also includes special monitors like leaf wetness. Its connected to NEWA, Network for Environment and Weather Applications, so farmers can collaborate and get trends in the weather and make predictions for what that might mean for particular crops.